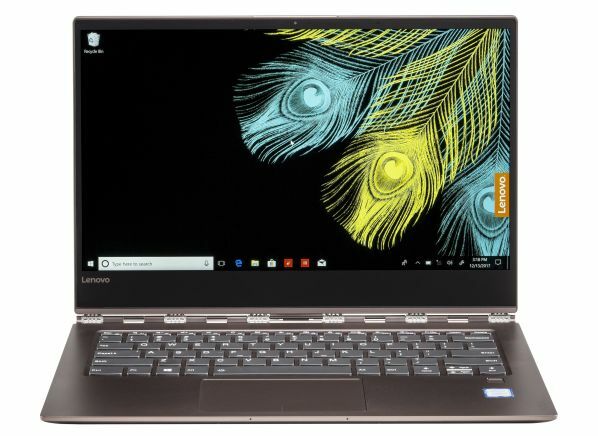 A 13.9-inch convertible laptop tested with Windows 10 Home, an Intel Core i7-8550U 1.8GHz processor, 8GB of memory, Intel UHD graphics 620 graphics, a touchscreen, and a 256GB solid-state drive. The Lenovo Yoga 920 14 is a 13.9-inch convertible laptop with a screen resolution of 1920 x 1080. It has 8GB of memory and a 256GB solid-state drive. It has an Intel Core i7-8550U 1.8GHz processor and an integrated Intel UHD graphics 620 video adapter. It lacks an optical drive for burning CDs or DVDs. It was tested with Windows 10 Home installed. It has a touch screen, 1 full-size, 2 type-C USB ports built-in on the laptop. However, you'll lose a USB port to plug in the power cable when charging the laptop. Video outputs include: supporting Thunderbolt and DisplayPort over USB-C. It supports WiFi 802.11ac, so it's compatible with the latest high-speed routers. It has a 0.9MP webcam for video conferencing. The Lenovo Yoga 920 14 measures 12.7 inches wide by 8.8 inches deep by 0.6 inches high, and it weighs 3 lbs.